President Gurbanguly Berdimuhamedov rides an Akhal-Teke on National Horse Day. The horse-loving president of Turkmenistan has stepped up to ensure his nation honours the favourite stallion that belonged to a former authoritarian leader, the late Saparmurat Niyazov. President Gurbanguly Berdimuhamedov has ordered that a monument be built to honour Yanardag (Fiery Mountain), the stallion that belonged to Niyazov, who is referred to as “the eternal president” and the “father of all Turkmen”. 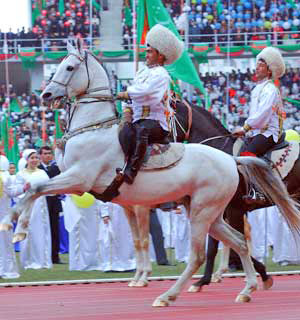 Niyazov elevated the role of horses in Turkmen society, placing an image of Yanardag in the national emblem. Berdimuhamedov has since continued the theme, instituting an annual national holiday in honour of the local breed, the Akhal-Teke. The day traditionally takes place on the last Sunday of April. Turkmenistan is home to more than half of the world’s 3000 Akhal-Teke horses. The president’s thinking in introducing the day was to promote the breed nationally and internationally. Berdimuhamedov is a fanatical horseman and has even written a book on local horse-racing. His horsemanship is a central part of the image he portrays to the nation’s citizens. Earlier this year, he sacked the head of the national state equine association for purportedly failing to promote the horse industry. Berdymukhamedov, in a televised government meeting on February 18, fired Allanur Oraznazarov, pointing to a consistent fall in the number of animals in state stables. Berdymukhamedov railed against empty horse-sport complexes, the quality of work in horse-rearing facilities, and the poor standard of veterinary medicine, treatment and specialists. “That is why our horse-breeders can’t take part in competitions abroad,” he told lawmakers. The president, in ordering the new statue, said it would improve the architectural and urban landscape of the city of Ashgabat. He gave permission for the city’s administration to engage contractors to construct the monument at a major intersection. Construction is to be construction in October 2013, with the monument to be commissioned in March 2014, the state news agency of Turkmenistan, TDH, reported.